KCS Old Boys RFC was founded in 1907. We play our home games at Motspur Park on the pitches behind the school grounds at Kingsway. The rugby club are fortunate to be the primary users of the Old King’s Pavilion which has good changing facilities and an excellent clubroom and bar. Our main pitch has match quality floodlights. Many boys at KCS will already have played at the club in the mini and junior sections. Several KCS 1XV matches are held on our 1XV pitch each season. We run two regular adult sides and an Under 21 XV during holidays. 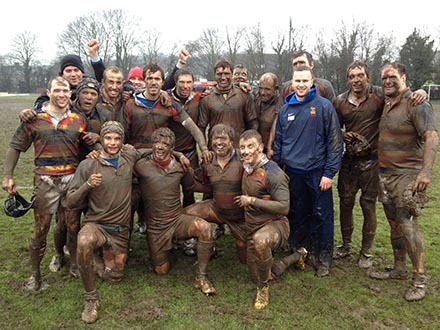 Our 1XV are one of the best Old Boys teams in London. The first event of every season is the Cronk Cunis Under 21 National Festival, a XV a side, one-day tournament. We won the event in 2008 and hope to do so again over the next few seasons with the excellent players coming out of KCS. Our current Under 18 team were unbeaten Surrey Champions in Division 1. We train every Tuesday and Thursday throughout the season. Pre season will start in July – watch the website for exact dates! We have our own coaching team with specialist strength and conditioning coaches. We have a physiotherapist and an osteopath available to our players on training and match days. Having re-established their place back in London 2SW at the culmination of the 2013-14 season King’s have enjoyed a solid four seasons back at Level 7 finishing 5th, 6th, 8th most recently 4th. Whilst the side finished last season impressively with 21pts from 25, this campaign has been better again as the team started well and has gone from strength to strength recording a series a victories, each one with a four try bonus point. This culminated in win number seventeen last weekend over Farnham and with a maximum 85pts achieved it meant that King’s were confirmed as league champions and were promoted to London 1 South. This achievement was made all the more special by virtue of being the first side in the English rugby pyramid to achieve this double honour and having done it at the very earliest opportunity in mid-February. Coached by Sam Richards (OK 2005) and captained by Tom Dugarin (OK 2007) with able support from on-field captains Will Slater (OK 2008) and Joe Mason (OK 2009) the success has been built on a core of players whose association with the club goes back many years and several of whom have played together through the Mini, Junior and U21s sections. Allied with some wise heads who have been involved in senior rugby for a number of seasons, the formula has proved to be a winning one. Level 6 is the highest the club will have competed at and will come with the added mileage associated with travel not just to Surrey and Hampshire but also E & W Sussex, Kent and even Essex. It is a 14 team league so there will also be 4 more fixtures to fit in to the season calendar. Still, all these challenges shall be embraced and hopefully overcome of course. Before then though there remain five games left to play – Twickenham (A), Old Emanuel (H), Old Reigatian (H), Old Cranleighan (A) & Old Alleynian (H) – and the team will have to maintain the high standards set to this point if the umblemished record is to be maintained! Regardless of what remains in 2018-19 this has aleady been a season to be proud of, we hope you’ve enjoyed what you have seen and will continue to lend your support in the next couple of months and the years to come. The season is nearly at the half way stage and the 1XV is now in 4th place in a highly competitive league. The games we have lost have generally been as a result of conceding tries from rolling mauls, something we do not do as well as other teams at this level. The game on Saturday against league leaders Cobham was a perfect example of this and we lost a great game by the margin of 30-28. Having said that we have had some marvellous wins and the win against London Cornish at the beginning of the season stands out. Our brand of rugby is highly entertaining and worth visiting Motspur Park. This Saturday we entertain Portsmouth at home (KO 2:pm). The 2XV have also played some entertaining matches culminating in a 23-22 pont win against Camberley 2XV last Saturday. This Saturday they are also at home to Teddington. Two good wins on Saturday. The last game of the season for the 1XV which leaves us sitting in 5th place in the league. I would have taken this at the beginning of the season especially considering that Farnham, who were promoted with us last season, have been relegated. Having said that two or three losses could have or even should have been wins which would have seen us finish as high as third. The top three teams just had too much power in the forwards for us to cope with, Our backs were a match for anyone. ITS NOT OVER:- The 1XV have made it through to the Surrey Trophy Final versus Guildford RFC at Esher RFC on Monday 4th May at 1pm. Please come and support what could be a fabulous bank holiday afternoon. Guildford are in London 1, a league above us !! THE U21s – They played three games in Christmas and Easter Holidays and won the Surrey U21 Shield beating Dorking 24 to 15 in the final last Monday having beaten Esher and Battersea previously. The 2XV have a final game at London Irish on Saturday and a win will finish 3rd in the league. As a preamble to the Internationals our two teams produced entertaining and high scoring games so that both sit in 4th place in their respective leagues. I attach Kelvin’s match report which of course you can find on our web site. I look forward to seeing many of you at the Past Players Lunch on Saturday. The bar opens at 12 noon!!! “I wanted to let you know about the funeral arrangements for my Father now that we have finalised them. 8th April and the service will commence at 2.20pm. There will be a wake afterwards at Malden Manor Bowls Club (on Malden Road, in Malden Manor Park, next to the playground) and everyone is more than welcome. It would be most appreciated if you could send me an approximate number of who might be expecting to attend beforehand if possible. ‘Now is the winter of our discontent made glorious summer…’ Of course I am exaggerating – but only a bit. Early Spring sunshine and warmth, combined with a firm playing surface, provided a perfect environment for King’s to express their preferred expansive style to the full. The Reigatians started and finished competitively, but for the most part were swept away by as complete a team performance as most of us have ever seen from a King’s 1st XV. The weather attracted a large crowd of distinguished and disreputable King’s alumni, parents and friends, and they were treated to an expansive display of attacking rugby, with clinically accurate finishing. We have of course known about the attacking potential in the King’s squad, and its realisation was as much a matter of focussed execution as of taking advantage of the perfect conditions. It was the King’s defence which in practice dominated the early stages, as waves of Reigatian attacks were effectively pushed back at or behind the gain line, with strong and technically effective tackling by all, and especially from the front row of Joe Mason, Captain Jonny Kiddle and Brett Williams. Mason was outstanding, steadily securing turn-overs and penalties for King’s throughout the game. The pack established dominance in most phases during the first quarter, and this naturally set up the platform for more and more expansive play as our metaphorical scoreboard ticked-up throughout the first half. The King’s half backs Will Slater and Rory Jones combined well, and cleverly mixed probing runs and kicks with regular launches of the speedy King’s backs. The scoring was opened by a Gareth Stoppani penalty goal. Soon afterwards, Slater broke deep into Reigatian territory; he was supported by another accurate run by George Taylor, and Will timed his pass to send George over the line for the first try. Stoppani converted. directed and weighted kick ahead by Luke Minors to race into the corner; flanker Diggie Forshaw touched down at the conclusion of a successful driving maul; number 8 Alex Humphries powered over the line for a robust solo try, which secured a bonus point; and Luke Minors athletically caught Rory Jones’s diagonal kick to the right wing, and touched down in the corner. Gareth Stoppani converted three of these tries, and the half time score was 39-0 to King’s. King’s naturally relaxed in the second half, occasionally trying some creative and adventurous attacking options. Further tries were recorded by Stoppani (from a clever kick by Minors), George Taylor (after one of his trademark outrageous steps inside…) and Tom Smith. Stoppani added two more conversions, and Minors slotted one of his own. Walton produced their most dominant lineout effort of the season, combined with energetic all round play. Winchester fulfil expectations. And London Cornish just squeezed past the always dangerous Alleynians 18-16. King’s now trail 4th placed Alleynians by 2 points with 3 league games to play, setting up our visit to Dulwich on 21st March. 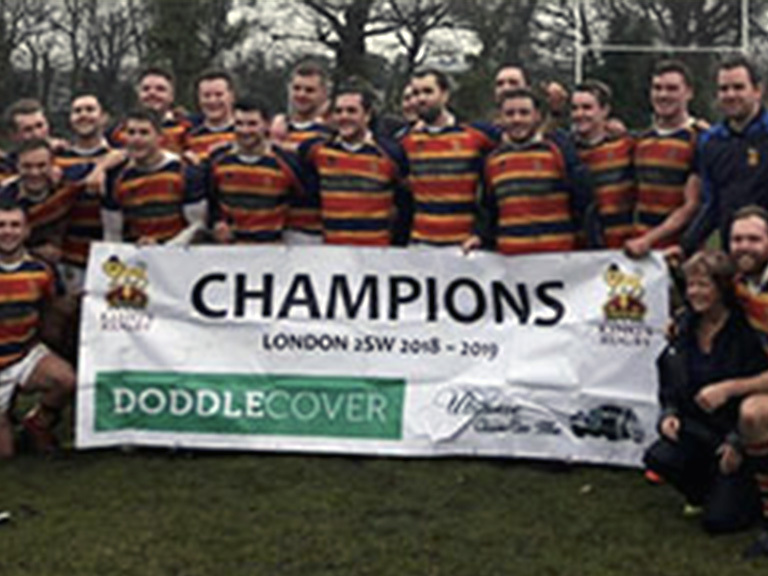 Saturday’s match doubled up as a semi-final of the Surrey Trophy, and we will now play Guildford in the final, which is presently scheduled for the Spring Bank Holiday Monday, 4th May, at Esher RFC. Back to winning ways, albeit a very tense game. After the dramas of the last few seasons its now a very relaxed team that sit 6th in the league with absolutely no chance of either promotion or relegation!